uuid : c3ebd892-2713-4197-8dd5-dd8ec99fb714 templates_id: 119600 templates_uuid: "569e5b6f-7a54-4b76-acbd-74d79588444b" title: "Parental Leave Policy - Parental Leave Entitlement - Parental Leave" display_name: "Parental leave policy" meta_keywords: "Parental leave statement" description: "
Notify staff and managers about the statutory parental leave system with this parental leave policy. Make sure your staff are up-to-date on when parental leave can be taken as well the notification requirements. This parental leave policy covers eligibility, the employer\'s right to postpone, and what happens when an employee returns to work after leave. Note that this is not the shared parental leave policy. A parental leave policy notifies staff and managers about the statutory parental leave system. Parental leave is the right for employees with 12 months\302\222 continuous service to take up to 18 weeks unpaid leave to care for a child, regardless if they are adopted or birth children. This right is available up until the child\302\222s 18th birthday. This is the minimum right permitted by law but can be enhanced. Employees must not be dismissed, subjected to detriment or treated less favourably for taking or requesting parental leave. Why do I need a parental leave policy? A parental leave policy ensures that your staff are up-to-date on when parental leave can be taken as well the notification requirements. Who is eligible to take parental leave? otherwise have legal parental responsibility for a child under 18 (eg the legal guardian). How should parental leave be taken? By default, leave must be taken in complete weeks (eg 1 week or 2 weeks) and up to four weeks per year may be taken, unless the employer agrees otherwise. Advance notice of 21 days must be given to the employer. Who should be the employee contact regarding parental leave? It should always be a person who can be relied on to know or check the legal significance of a parental leave application or other employee queries and to take further action where needed. This will normally be an HR representative, or if there is none, the person with responsibility for HR matters. Do I need to pay an employee during parental leave? By law, parental leave is unpaid. Employers can implement the minimum rights required by law or offer rights over and above what the law requires (eg paying parents during some or all of their parental leave). How do I set out pay arrangements? Make sure the description regarding any parental leave pay arrangements are clear and unambiguous. If you mean basic pay only then say so. If there are any limits or qualifications then specify these (eg 50% of your normal basic pay for up to two weeks per year). Can I extend parental leave to those without 12 months\302\222 service? Normally parental leave is only available to staff with at least 12 months\302\222 of continuous service. However employers can extend parental leave to those who aren\302\222t eligible by offering rights over and above what the law requires. The parental leave policy should be stated in the staff handbook. What if there are disability concerns? If the child is in receipt of a Disability Living Allowance, the parent is allowed to take parental leave on \302\221odd\302\222 days ie the parent doesn\302\222t have to take parental leave in one-week blocks. Some employers will offer better entitlements or benefits than the legal minimum and employees can check this in their staff handbook. What happens to the employment contract during parental leave? During parental leave the employment contract continues except for pay and benefits. This parental leave policy is governed by the law of England and Wales.
" created_timestamp: "2018-10-08 04:37:15.0" modified_timestamp: "2018-10-08 04:37:15.0" active: true created_by: 236 modified_by: 236 dcm_id: 269 url_slug: "Parental-leave-policy" meta_description: "Draft a parental leave policy so that staff and managers know about the statutory parental leave system with guidance from Rocket Lawyer. Outline who can take parental leave and when it can be taken. Try this parental leave policy. " time_to_complete: "10 minutes"
Notify staff and managers about the statutory parental leave system with this parental leave policy. Make sure your staff are up-to-date on when parental leave can be taken as well the notification requirements. This parental leave policy covers eligibility, the employer's right to postpone, and what happens when an employee returns to work after leave. 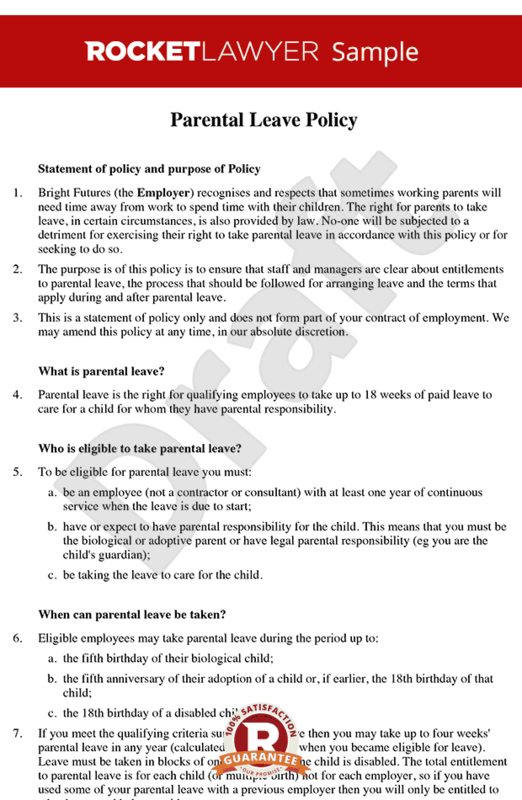 A parental leave policy notifies staff and managers about the statutory parental leave system. Parental leave is the right for employees with 12 months continuous service to take up to 18 weeks unpaid leave to care for a child, regardless if they are adopted or birth children. This right is available up until the childs 18th birthday. This is the minimum right permitted by law but can be enhanced. Employees must not be dismissed, subjected to detriment or treated less favourably for taking or requesting parental leave. Can I extend parental leave to those without 12 months service? Normally parental leave is only available to staff with at least 12 months of continuous service. However employers can extend parental leave to those who arent eligible by offering rights over and above what the law requires. The parental leave policy should be stated in the staff handbook. If the child is in receipt of a Disability Living Allowance, the parent is allowed to take parental leave on odd days ie the parent doesnt have to take parental leave in one-week blocks. Some employers will offer better entitlements or benefits than the legal minimum and employees can check this in their staff handbook. More than just a Parental leave policy template, our step-by-step interview and guidance makes it easy to create your document. Easily create online, download, print and sign your free Parental leave policy in minutes. This document is also sometimes called: Parental leave statement.